Demographic Sync: All patient demographics in Elation can be imported to Spruce, including name, phone number, email address, date of birth, and gender. New patients that you add to Elation will automatically sync with Spruce. Any updates you make to patient demographics in Elation or Spruce will sync across both systems. Conversation Sync: Document conversations you have in Spruce in the correct patient chart in Elation by selecting one or more messages in the Spruce web app to create a new Visit Note in Elation and choosing which patient chart the Visit Note should go to. For all other EMRs, Spruce is designed to make it easy for providers to transfer patient information and keep records up-to-date. This can be done using either conversation links or specially formatted copy and paste. Conversations links are unique links that allow one-click access to a patient’s communication and care history on Spruce. 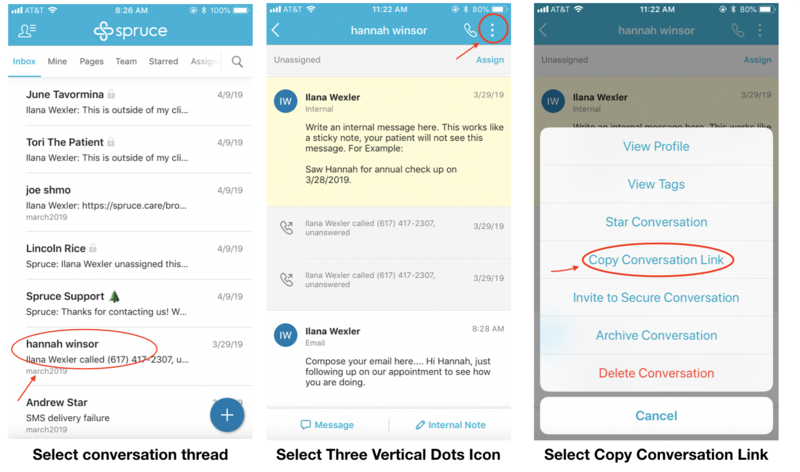 To copy a conversation link, open the patient conversation and select the Three Vertical Dots Icon in the top right corner. Select Copy Conversation Link. This copies the link to your clipboard. Now you can paste the link into your patient's record in your EMR. Selecting this link from your EMR in the future will take you directly to the patient’s conversation on Spruce (as long as you are logged in to Spruce). The link will always take you to the most recent interaction with that patient on Spruce. To copy specific patient interactions into your patient’s chart, Spruce on the web supports a unique formatted copy and paste feature. To copy and paste specific messages from Spruce to your EMR, first open the patient conversation in Spruce from a web browser (not the Spruce mobile app). Highlight the relevant messages copy the highlighted text, and paste into your EMR. 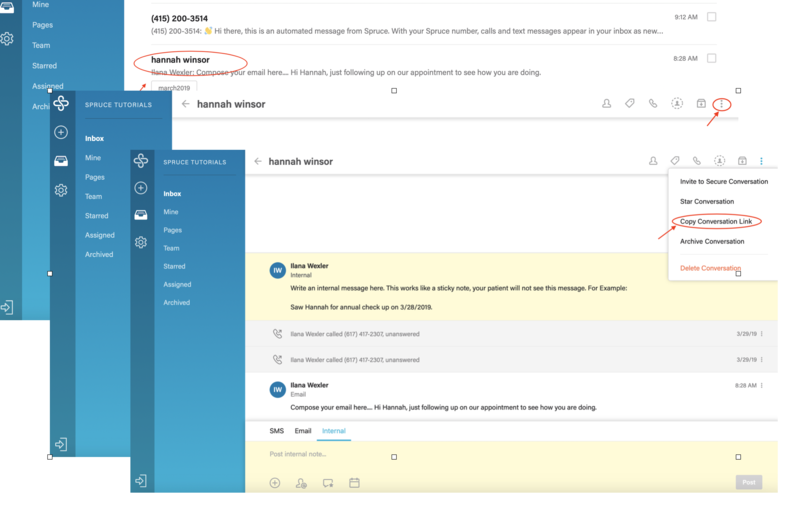 The pasted text will be formatted to include the sender of each message, the channel in which it was sent, and the time of each message.